I need to move along here and try to wrap up my coverage of the workshop on icy satellites; I still have a day's worth of notes left! Here goes, an attempt to breeze through Tuesday afternoon's session on the geomorphology of stuff in the outer solar system...as before, links from talk titles go to abstracts in PDF format. The session was opened by Jeff Moore giving a survey of "Erosion and Regolith on Outer Solar System Satellites." Although intended as an overview, his talk quickly focused on Callisto as one of the weirder erosional environments in the solar system. For instance, he pointed out landslides all over the outer solar system, even on some of the very oldest surfaces, like Callisto and Iapetus. 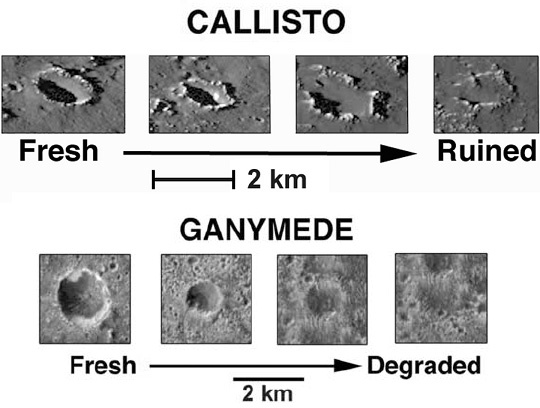 Interestingly, Callisto is unique among the Galilean satellites of Jupiter for having these debris avalanches. It also has a truly bizarre process by which its craters appear to fall apart over time, "until they look like Stonehenge." 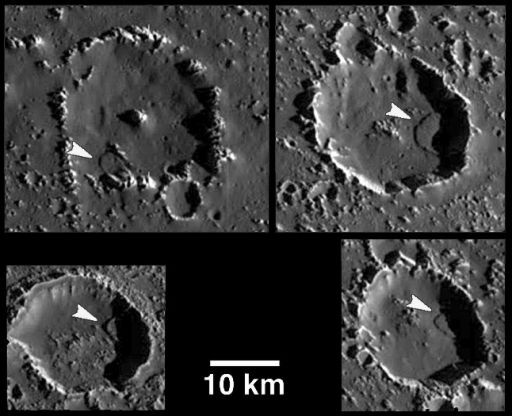 This is quite different to the way that craters degrade on other icy worlds, where viscous relaxation eventually flattens them out. In this model, Callisto starts out with a surface roughened by impacts. Volatile materials -- water ice and, probably, carbon dioxide ice -- sublime from this surface and then get redeposited. 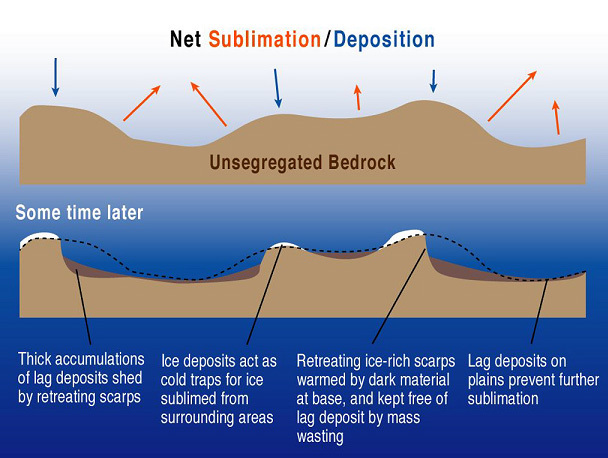 Physical models suggest that the floors of these craters will experience net sublimation, while the peaks will experience net deposition of frost, a process that accelerates as the floor accumulates a lag deposit of dark materials (which absorb more solar radiation and thus get warmer) and the peaks accumulate a deposit of bright, reflective frost. Bedrock is only exposed in the steepest part of the crater walls. The same process may be operating on Iapetus and Hyperion. 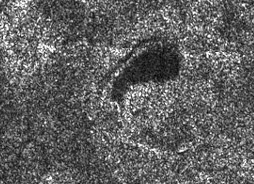 This dark feature, one of many possible lakes near the north pole of Titan, is partially encircled by a cliff. Radar illumination is from the north; north-facing slopes are bright, south-facing slopes are dark. The morphology looks much like volcanic calderas, where multiple episodes of volcanic eruption and collapse can yield nested, kidney-shaped crater features. Later in the session, Karl Mitchell gave a talk on "Titan's North Polar Lakes as Observed by Cassini Radar: An Update." I've talked about Karl Mitchell's work before, and Brad Thomson blogged about it from DPS last year. In both cases, Karl was talking about the lakes in Titan's north being possible calderas, constructs left over by the collapse of cryolava chambers. 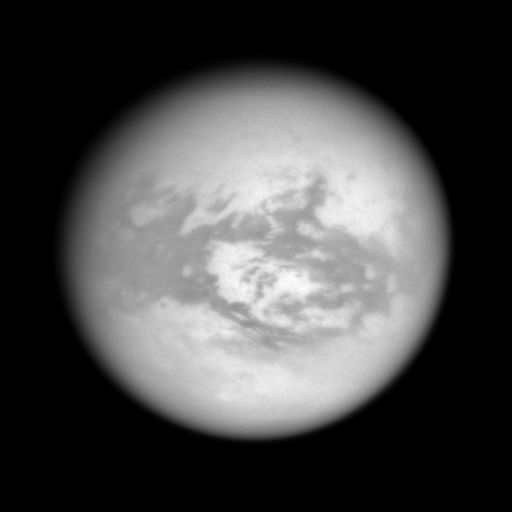 However, as the RADAR coverage of Titan's north has become more complete (they've now got more than half the pole northward of 65 degrees latitude imaged), Karl is modifying that conclusion. Looking at a mosaic of all these RADAR swaths (a mosaic that, alas, has not yet been released to the public), Karl pointed out that there seem to be several regions of lakes, each of which has lakes of a different character. All the large lakes are clustered in one area. Another area has mostly small, circular, steep-sided lakes. Another has medium-sized, irregular-shaped, steep-sided lakes. Titan's equatorial regions are covered with dark-toned deposits of sand dunes. This image, of the anti-Saturn side of Titan, was captured by Cassini on June 14, 2007. The bright region at the center is called Adiri; the Huygens probe landed off of the northeastern edge of this bright region. The image has been rotated so that north is up. The trailing hemisphere is to the left; the leading hemisphere is to the right. In Jason's high-resolution mosaic, you could see more of the same wind effects that the ISS team has been observing since the beginning of the mission: prevailing winds blowing generally from west to east are creating dark dune fields, which drape around brighter regions of higher-standing topography. The western margins of bright features tend to be sharp, while the eastern margins are diffuse, reflecting the topographic obstruction of the dunes to their west and their gradual reorganization in the lee of the topographic features to their east. Bill Johnson gave a talk on "Cassini RADAR Altimeter Observations of Titan." His talk included an explanation, which I hadn't appreciated before, of why altimetric observations have been so difficult for Cassini. It's just that the geometry of the flybys is really pretty much totally wrong for an altimeter. An altimeter would like to be flying at pretty much a constant altitude over a body, so that the change in delay time along-track has only to do with local topography. But when Cassini is close to Titan, its RADAR instrument is usually performing SAR imaging; altimetric data is only collected between about 18 and 30 minutes before and after closest approach. As a result, when Cassini is collecting altimetric data, "we are moving toward the surface at two meters per millisecond. You don't want to do this with altimetry," Johnson said. They have actually done one flyby, T30, where "we sacrificed about half of our SAR swath to do altimetry." He showed that altimetric profile, and there was, indeed, lots of interesting structure. The T30 altimetric profile turns out to have tracked right down the middle of the SAR swath acquired just two flybys previously, on the T28 pass. Since nothing having to do with Titan is allowed to be easy, correlating the SAR imagery with the altimetric profile is proving to be challenging. So, Johnson's first conclusion from the altimetric studies was a rather conservative one: "Titan is not a smooth sphere." This elicited a chuckle from the audience. After the coffee break (which was when I acquired what proved to be too much caffeine), Bonnie Buratti gave a really interesting talk on "Opposition surges on icy and rocky moons." 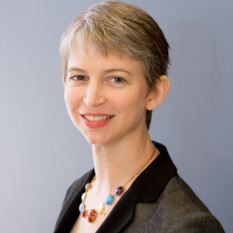 Bonnie defined what "opposition surge" means: "As a moon becomes full, it becomes brighter than what you would expect by extrapolating from other phases." You see opposition surges by looking at a graph of how bright a surface is with respect to the phase angle at which it is illuminated. I don't have such a graph handy but I do have some nice images showing opposition surge effects seen from Earth in Saturn's rings. Three views of Saturn captured on different dates with the 2.2-meter telescope at the Calar Alto Observatory in Spain. Phase angles are measured in degrees. On January 13, Earth crossed the disk of the Sun as seen from Saturn, so Earth-based telescopes saw Saturn and its rings and moons with a "phase angle" (Sun-target-observer angle) of zero degrees. The globe of Saturn does not change much in the three views, but the rings flash into brilliance as the phase angle goes to zero. This effect is called "opposition surge" and was also seen on some of Saturn's moons, especially Enceladus. There appear to be two types of opposition surges. What Bonnie called "canonical" opposition surge is related to how "fluffy" a surface is. If it's fluffy, or rough, particles will cast shadows on other parts of the surface when viewed from some angle. But as you go down to zero phase -- viewing the surface with the Sun directly behind you -- those shadows are hidden, so the surface brightens with decreasing phase angle. Then there is what Bonnie called a "spiky" opposition surge, which is only seen at very low phase angles (like less than 0.2 degrees), and likely has to do with "coherent backscatter." Among surfaces in the outer solar system, Triton has very little opposition surge, indicating a compact (not fluffy) surface. Titania and Oberon have huge surges. Clementine also saw a decent-sized opposition surge at the Moon (an effect you can't see from Earth because at opposition you have a lunar eclipse!) Cassini has seen nice opposition surges on rings, and obviously, so have Earth-based telescopes. "Practically everything in the solar system seems to have a standard 'fluffy' opposition surge of varying magnitude," Bonnie said. "Enceladus is particularly fluffy. There are only a couple exceptions, Triton and [asteroid] 1175 Anchises. Most objects also have 'spiky' surges, within 0.2 degrees. Triton does. Umbriel does not." However, not many objects have been observed at the tiny phase angles necessary to see "spiky" surges, Bonnie said. "There are only a few hours where they're at these small phase angles; the small angles are almost never seen for Kuiper belt objects." Recently, there were some observations of Iapetus with phase angles down to 0.03 degrees. Bonnie is on Cassini's VIMS team, and using VIMS data, she reported that she saw the spiky surge there; however, the observations were from too far away to discern whether both the bright and dark terrains on Iapetus produced the spiky surge, or if only one of them did; Iapetus was less than one pixel to VIMS. ISS has higher resolution though; Bonnie was asked whether ISS data has revealed whether the spiky surge is seen in both terrains, but she said that since the ISS data has not been released to the public via the Planetary Data System yet, she was not at liberty to say. Next, Tilmann Denk gave a talk on "The Surface of Iapetus." This was, in large part, a preview of what we might expect from the close flyby, now only three weeks away. Tilmann showed some lovely high-resolution images comparing the textures of the dark and light terrains. "There are craters everywhere. Dark terrain exhibits the same amount of craters as bright terrain. In case you are interested in the 335-year-old-question how the dark-bright dichotomy has been formed, then you must also explain how there are the same number of craters in dark and light terrain." This view was produced from three captured through ultraviolet, green, and infrared filters on October 15, 2004. An intriguing line of white peaks sticks up above the brownish dark terrain, part of Iapetus' "belly band." The full resolution image has been enlarged by a factor of two to show detail. 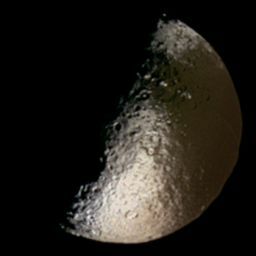 The leading side of Iapetus is on the right, with the trailing side mostly in the dark. The redder color of the bright terrain on Iapetus' leading side is clearly visible. The famous ridge found exactly on Iapetus' equator does not span the whole surface, Tilmann pointed out; it is only about one third of the way around. In some places it has clearly been obliterated by a large impact, but in most places where you might expect it to continue, there is no sign of it; it even turns in to a trough for one short stretch. This is another mystery. Tilmann also pointed out that Cassini data reveals color variations across Titan. Within the dark material, if you do a ratio of ultraviolet and green images, these color variations "pop out." There is also a color dichotomy independent of the bright-dark dichotomy between the leading side and trailing side, such that the leading side, both where it is bright and where it is dark, is redder than the trailing side. Tilmann finished his talk by showing an animation of where the Cassini ISS frames will fall on Iapetus during the upcoming flyby, an animation that I wish I had to show you! But I don't. There's just one more talk from this session that I listened to before bugging out, but as my daughter is waking up from her nap I'll have to save that for another day!